Bobby Russell heads home the opening goal in the first minute. Dunfermline suffered a Hogmanay hangover as Raith Rovers ran riot on New Year’s Day, 1983. An incredible 6-0 win over their fierce rivals in front of 2300 disbelieving fans at Stark’s Park was their best ever win on January 1 – and they could have had more. Thomson (centre) adds the fourth. Little wonder that jubilant manager Gordon Wallace directed his players to take a bow before their delirious supporters at the final whistle. On the few occasions that Dunfermline threatened during the game, the Kirkcaldy defence was dominant, and goalkeeper Tommy Walker proved he was not lulled into a false sense of security by long periods of inaction with a couple of excellent saves. The midfield trio of Marshall, Houston and Kerr were magnificent, and the latter was rewarded by scoring one of the finest goals seen at Stark’s Park for many a day. The match kicked off and before the Pars had even drawn breath Rovers took the lead after just 54 seconds. Spence was fouled on the left by Crawford, and when Candlish lofted over the free kick. There was Russell rising between two defenders to head down into the ’keeper’s right-hand corner. Goal number two arrived in 26 minutes. Keeper Walker’s massive kick from hand was head flicked on by Harris to Russell who raced into the box end delivered a precise right-foot drive low to Moffat’s right from 14 yards. Twelve minutes later, the crowd were treated to a rare piece of artistry by Dave Thomson who lifted the ball over two defenders and sent a shot just wide with a scorching volley. But two minutes from the interval Jim Kerr scored a spectacular third goal. A right-wing corner by Charlie Spence was only partially cleared, and Kerr had time to let the ball bounce in front of him before unleashing a tremendous right-foot volley which screamed into the postage stamp corner high to the ‘keeper’s left. 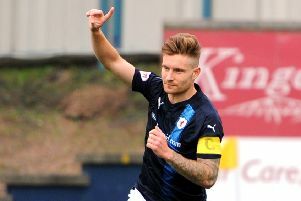 Raith did not let up in the second half, and took only five minutes to increase their lead. It was Dave Thomson who got his name on the scoresheet for the first time this season, heading powerfully home at the far post from a Colin Harris corner. Dunfermline had their best chance of the game in 56 minutes when Morrison cut inside from the left to let fly with a shot which Walker did well to block, and even better to hold the ball cleanly from the rebound fired in by Forrest. Colin Harris had worked tirelessly for Raith up front, and he received due reward by claiming his side’s fifth goal. Russell flicked a beautiful pass over the despairing Dunfermline defence, and Harris was able to run on and lash the ball high past Moffat for his 15th goal of the season. Ian Ballantyne substituted for Charlie Spence in 77 minutes, and less than a minute after coming on he found the net with only his second touch of the ball. Kerr swung the ball from the left to Marshall on the right side of the box, and his cutback from the bye-line was turned in at the near post by Ballantyne. Five minutes from time, Rovers might have scored a seventh when Russell led a forward break with Ballantyne free on the left and Harris available on the right, but he was eager for his hat-trick and mis-kicked his shot well wide. At the final whistle, Raith were deservedly given a standing ovation by the home crowd. Raith: Walker, McDonough, Candlish, Houston, Thomson, Gillespie, Marshall, Russell, Harris, Kerr, Spence (Ballantyne 77). Sub. Steen (not used). Dunfermline: Moffat, Crawford, Robertson, Considine, Wilcox, Donnelly, Hamill, Morrison, Rodier, Jenkins (Smith 34), Forrest. Sub. Ford (not used).